Here’s a detail of Rush Creek, which I ascended from West Fork Campground to Mt. Wilson. temps and winds, but in that flat gray light that’s such a part of our days in the canyons of the San Gabriels. Lots of alders and oaks have come down across the one and a half miles of the Gabrielino Trail that crosses and re-crosses the West Fork of the San Gabriel River between these two campgrounds. In many places, white alders seem to have broken mid way up their trunks, leaving behind shattered snags by the dozens. Oaks have laid down, too. Over and over, I kept on seeing the fresh, black carbon scars on the bases of trees from the Station fire of 2009. Dams of driftwood had piled up high across the stream here and there, yet the old West Fork meandered under and through, not seeming to care at all about these very temporary nuisances in the life of a river. West Fork of the San Gabriel River. View is looking upstream toward West Fork Campground. My feet were already damp from all the crossings by the time I arrived at West Fork campground. A few folks were camping here as I wandered over to the site of the first ranger station in California. Now only a 1950′s era Daughters of the American Revolution monument marks the place where Louis Newcomb hewed his ranger cabin back in 1900. You can still see the reassembled cabin at its’ relocated spot adjacent to the Chilao Visitor Center up Highway 2, not far from Newcomb’s Ranch. Now the work was to begin…. Rush Creek joins the West Fork just to the east of the campground. Wet blackberry bushes, stinging nettles and thickets of young alders marked the beginning of the canyon. The elevation gain to the top of Mt. Wilson is close to 2,700′ in less than two miles of bouldering. Lower Rush Creek is slow-going. Here the stream’s choked with fallen alders and berry bushes. Rush Creek is true to its’ name! The stream fell rapidly over a myriad of small waterfalls and cascades, punctuated occasionally by a few yards of calm and gentle descent. The canyon bottom, like most in this part of the front country, was mostly narrow and fringed in mosses and ferns. It seemed that most of the rock surfaces were damp and slick, which added an ice-like slickness to my challenges. However, if you take your time carefully choosing your route up and around the small waterfalls and cascades, there’s no need for ropes or any climbing hardware. Just take your time, which is what I did. Tumbling Rush Creek Falls. It’s about thirty-five feet high. I climbed to the left of it. Water falling through a slot about half way up Rush Creek. A little better than half way up, I had to choose a canyon for my final route to the top of Mt. Wilson’s eastern end, not far from the 100” telescope dome. Eventually I chose a fork toward the left which turned out to work out fine. Like all x-country approaches to Mt. Wilson, the semblance of a canyon soon morphs into sandy, steep slopes pocked with rock outcrops and exposed tree roots which are great for hand holds at times. It took from about 9:40 a.m. to 2:30 p.m. to make the trip between the mouth of the canyon to the top. It was both exhausting and exhilarating, with grand views out toward Twin Peaks and Mt. Waterman in the back country. The flat, gray wintery light filled me with thoughts of past Christmas-time hikes and those who I had shared them with. Here and there in the shadows, amongst the towering Big Cone Spruce, incense cedars and sugar pines, memories of my brother Nick kept following me up Rush Creek. At one point earlier in the day, along the West Fork between DeVore and West Fork Camp, I saw the spot where he and I had been hiking one autumn years ago and had stopped for a photo in the fallen maple leaves. I could still see him leaning against a scraggly tree in his relaxed lean, pack still on. Nick passed away last January 9th from complications of chronic kidney disease. He’s a couple of years younger than me, which on a number of levels has made his early passing even harder to bear. Somehow this canyon had become the place, so late in the year, with her peaceful greens and grays, which allowed me images of my brother, thoughts of him, to flow quietly through my being. A calm healing had been seeping into me throughout the ascent of Rush Creek, one like I had not experienced until now. This thought kept tumbling through my head, “our time here on this earth is brief under the best of circumstances.” Just keep on climbing and you’ll be at the summit and so will he. So, the rest of my ascent had become a pattern of short scrambles, searching for stable footholds, letting my heartbeat slow down and starting, again. Peering out at Twin Peaks from upper Rush Creek. Here the forest is lush, green and healthy. Eventually I topped out into a forest of scrub oaks, following a gentle ridge to a lonesome picnic table along the Rim Trail. My eyes were damp. Like most of my x-country hikes, I found myself wondering where this canyon had been all my life. Soon, my soaked shirt had begun to turn to chill, so I changed into a dry top, had a little cheese and pita bread sandwich and kept on walking in the dimming light. flashlight out for the rest of the trip back to Fern Lodge in the Big Santa Anita Canyon. Soon I began to pick up the pace, trying to beat the impending darkness. A calm peace ran through my bones as I headed toward Newcomb Pass and then down toward Sturtevant’s Camp. You know, the fantastic way you feel when you’ve gotten in miles and miles of canyons and ridge tops, before you arrive where you can take off your boots and stay awhile. My old friend Bohdan greeted me in the dark near Falling Sign Junction and we hiked together back to Joanie and the warm, lit cabin with dinner on the stove. This day was more than good. Sunset from the Rim Trail between Mt. Wilson and Newcomb Pass. A group of white alder trees blew down across the trail in last week’s storm between Roberts’ Camp and Fern Lodge, Big Santa Anita Canyon. The Pacific storm that rolled in late last week brought much needed rain to the Big Santa Anita Canyon and the rest of the San Gabriel mountains. Along with the rain came high winds that raked canyons and ridge tops, blowing down lots of drought stressed trees. My wife and I were hiking in this last Friday evening when we stumbled across five fallen alders, all parallel to one another and completely blocking the trail. The location is the stream side wide spot of the Gabrielino Trail between Roberts’ Camp and Fern Lodge Junction, right where the dirt road ends at cabin#26. All the hiking trails that radiate out of Chantry Flats are for the most part maintained by volunteers, with the exception of the occasional U.S. Forest Service fire crew. These trees were cut out of the way by local cabin owners and Forest Service volunteers. Hopefully, more storms are on their way. We received 2.78″ of rain at Fern Lodge, bringing the canyon up to nearly 6 inches of rain for December. The Gabrielino Trail between Roberts’ Camp and Fern Lodge Junction has just been cleared of fallen white alders. Big Leaf Canyon Maple leaves blaze in this vertical view of tree canopy. Winter Creek, between Fern Lodge and Hoegees Campground. We received nearly an inch of much-needed rain on Halloween in our parched Big Santa Anita Canyon and Winter Creek. Yet, it didn’t really do much to increase the Big Santa Anita Canyon creek flow. To date, it’s been rainless for all of November, yet the autumn beauty is as good as about any year. Poison oak has been reddening for months and the Big Leaf Canyon maples have been gradually changing color. Yellows and golds abound in many of the tree canopies as well as fallen leaves on boulders, slopes and in the stream beds. The scent of leaves and damp soils is really noticeable right now, especially right along the streams. Crickets chirp throughout the day in many of the shadowy pockets to be found along the hiking trails. With the sun dropping so far to the south on these shortening days, the light is angled to the point that perpetual shade can be found along the north and east facing slopes of the canyons. The days are so short now, many of us find ourselves hiking the last couple of miles back out to the trailhead in the dark. Big Leaf Maple leaves have come to rest in Winter Creek pool. Big Santa Anita Canyon’s stream has come up, albeit slightly. Photo taken between Roberts’ Camp and Fern Lodge. of how much water it takes to sustain these deciduous trees. So, even with out the rain, there’s now just a bit more stream sound than a couple of weeks ago. What a great time to get out for a hike and take in the beauty and peace of our San Gabriel mountains. 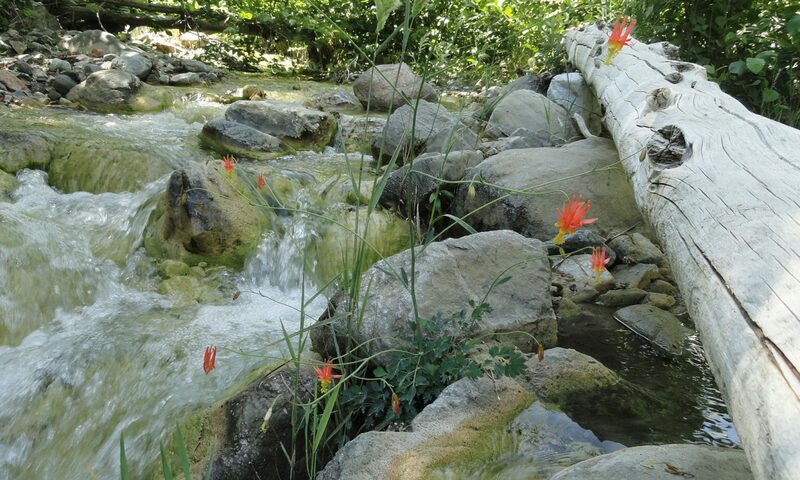 Three years in a row of sub-normal precipitation has taken its’ toll on the Big Santa Anita Creek throughout the canyon as well as the entire Angeles National Forest. Plants and animals throughout the San Gabriels are feeling the impact. Big Santa Anita Canyon’s stream is now running underground in many places where in years past you might have seen and heard water flowing in even the hottest months. Sturtevant Falls is just a trickle. It’s magnificent plunge pool reduced to just a stagnant little puddle in the glaring mid-day sunlight. What little water that makes its’ tumbling way down the 55′ high rock face sounds little better than a half-flowing garden hose placed up at the top followed by a slap, slap, slapping broken chorus of wet. Once tumultuous, cool pools are now fringed with dead mosses and algae. Big Santa Anita Canyon’s stream bed has turned dry. This scene, looking up canyon, is midway between Roberts’ Camp and Fern Lodge. Vast stretches of white sands are mixed with the black pieces of muddy organic deposits that settled in like the bottom of a still and quiet lake. You can see this as you make your way down along the Big Santa Anita Creek on the Hermit Falls trail between Roberts’ Camp and First Water. Check out these dry, flat and pungent stream bed crossings that once had swimming fish and the flotsam of countless water striders on peaceful waters. The mexican quick weed, seemingly immune to these endless hot days of dryness, fringe these once wet spaces and in places are glade-like, blocking your view of the ground. Suddenly, the air lifts the pungent scent of dried out plant and animal life, filling your senses in a way that leave the words out of your thoughts. Our common organic connection, constant and everlasting. I’m reminded of an ancient past that was never handed down to me through the pastels of words. Haunted and somehow led back toward home – in a good and kind sort of way. Poison oak leaves reddening early in the season amidst manzanita. Upper Falls Trail. Yet, like everything we and this old earth go through, it will come to pass away. Drought is a familiar visitor in these steep, deep canyons. A new winter will come with its’ fulfilled promises of rain and life. The sound of tumbling waters and the staccato call of canyon wrens will bounce back off the ancient rocky walls of the canyons, again. Once, again, if you miss that jump across the creek, your boots and socks will be soaked. The glance between you and the hidden trout will happen once more. It will happen to you. The seasons go round and round.